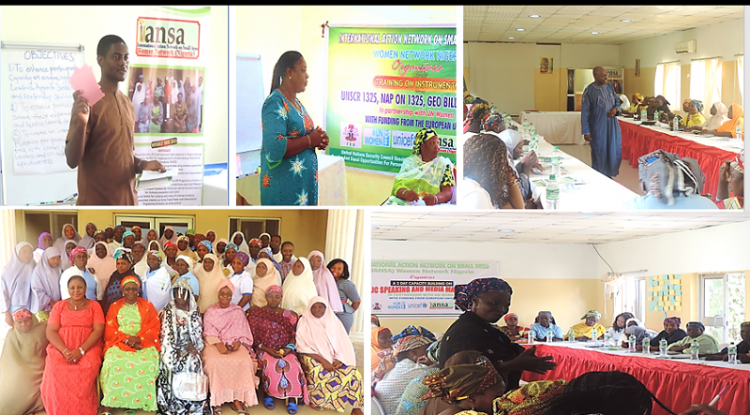 Funded by the European Union and implemented by UN Women, in collaboration with UNICEF, IANSA Women Network Nigeria, and the Federal/State Ministry of Women Affairs and Social Development in Gombe State. – This Project is aimed at enhancing a conducive environment for the implementation of UN Security Council Resolution 1325 at the national level and in selected states, LGAs and Wards, and to promote access of women and girls to justice and other services. Objectively, to support the legislative process through advocacies and sensitization of stakeholders towards policy formulation. – Several activities have been implemented with various target group (Leadership of Gombe State House of Assembly, Traditional rulers, LGA chairs, Heads of MDAs, Religious leaders) which includes; Advocacy visits, engagement, and sensitization, as well as training on various instruments and other capacity building training (for women groups) such as conflict transformation, peace building and small arms control, Public speaking and media engagement. Training and sensitization of policy makers on various instruments. Paralegal training who have also stepped down the training. -The activities carried out so far is yielding measurable outcome; – The inclusion of more women in the traditional council and other political appointments in the state is viable – Gender-sensitive peace architecture in the state has been established and reforming to include forums of dialogue, early warning systems and rapid response mechanisms – For conflict resolution, Local capacities of women in peace-making is being shaped to monitor and report human rights abuses and gender based violence affecting girls and women.